Chapter seven of the Xenoblade novelisation, and a triumphant return! “Got it!” Shulk led them back towards the commercial district. 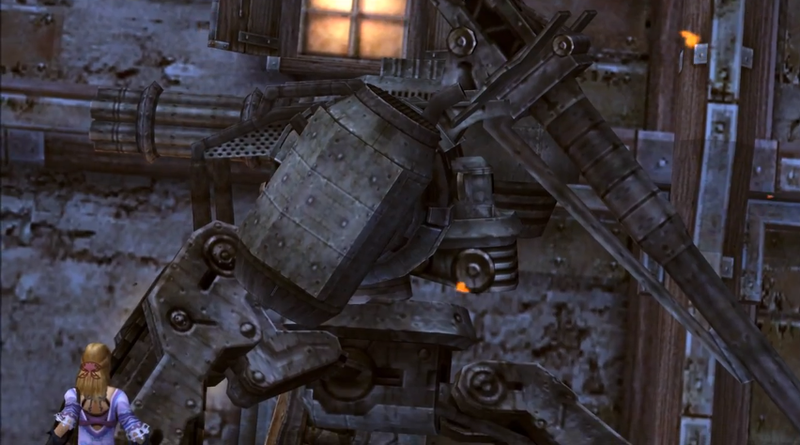 Reyn quickly dashed into the open warehouse and returned with the ether cylinders. Making sure they were securely strapped to his shoulder, Reyn ran with his friends back the way they had come. In the central plaza, the trio made for the bridge that connected it to the residential district. A smile swept across Shulk’s face; he could see the mobile artillery on the other side of the bridge. A Mechon M72 plummeted from the sky, smashing into the ground directly in front of the Homs. They skidded to a stop as Mechon rained down around them. 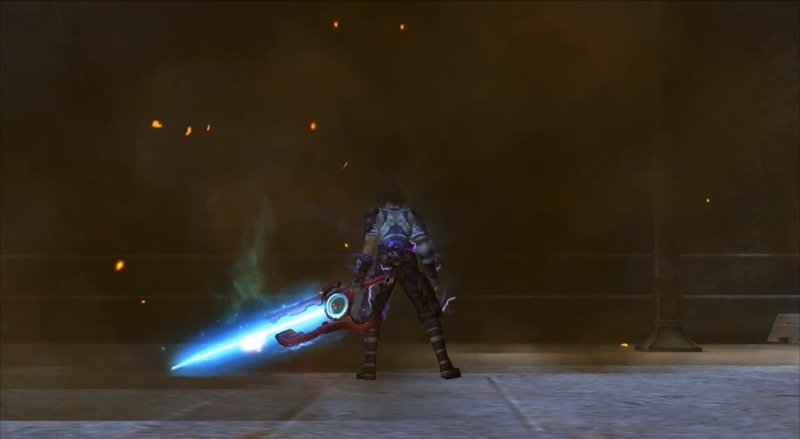 “What the?” Reyn pulled out his weapon. Turning, Shulk was dismayed to see a Mechon horde approaching from the commercial district; amongst them was an M82, towering above all the rest. He took a deep breath to clear his mind, and then unsheathed his sword. The three friends stood in a triangle facing outwards, to better observe the machines. “Looks like it,” growled Reyn. He didn’t take his eyes off their approaching foes. “Fiora! Reyn and I will open up a path. Then you can run through.” Shulk braced himself for the argument he knew would come. “Please, Fiora,” said Shulk gently. Suddenly he turned, raising his sword above his head to block a strike from an M72. 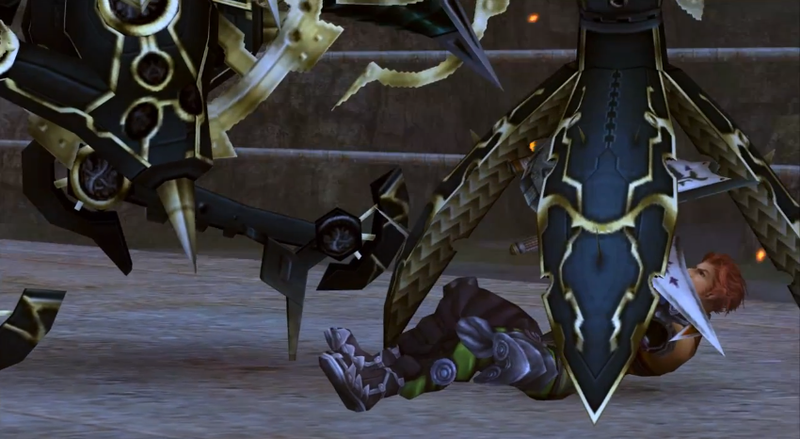 Reyn strolled to the side of the creature and shoved it to the ground. “Shulk… Reyn…” Fiora was afraid to leave the boys alone. “Don’t look so worried,” grinned Reyn. “We’ll just get rid of these ones.” He nodded at the Mechon on the ground, struggling to get back up. “Shulk won’t get a scratch!” Both he and his best friend quickly took it out before it could get back up. “Go now, Fiora!” said Shulk quickly. “Of course!” He turned to Shulk as Fiora ran to the mobile artillery. “Looks like she trusts me after all!” he said smugly. Suddenly Shulk cried out as he was shot in the back by an ether bullet. Reyn quickly looked around for the attacker; an M31 unit was hovering close to Shulk, its guns trained on him as he began to rise. “OI!” Reyn bellowed. He dashed towards the machine and brought his weapon down on its head, cracking the piece of metal holding its propellers in place. The propellers spun off the machine and it fell out of the air; Reyn ducked and they flew into another M31’s eyepiece, which then dropped to the ground. Rather pleased with himself, Reyn looked over at Shulk and was alarmed to see an M51 unit making its way towards him; M51 were identical to M69 in appearance, but were weaker than their counterparts. 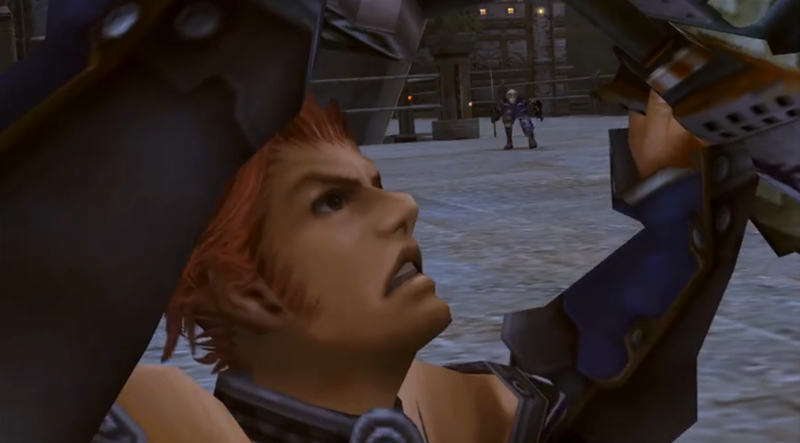 Reyn gave a shout of warning to Shulk, who looked up and just managed to deflect the Mechon’s attack; Reyn reached his friend at this point and rammed the machine with his shield, knocking it to the ground. He pulled Shulk to his feet and together they destroyed it. 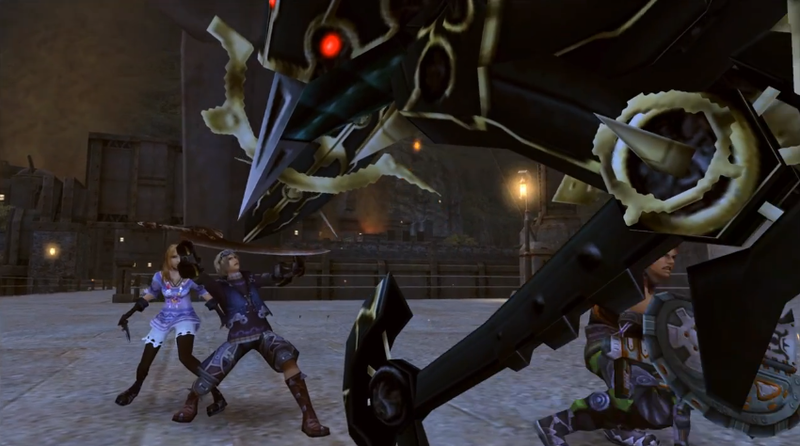 Reyn and Shulk backed into the centre of the plaza as the Mechon surrounded them. “That was a close one,” said Shulk. “Tell me about it,” Reyn agreed, shaking his head. He and Shulk looked up sharply at the sound of an explosion. 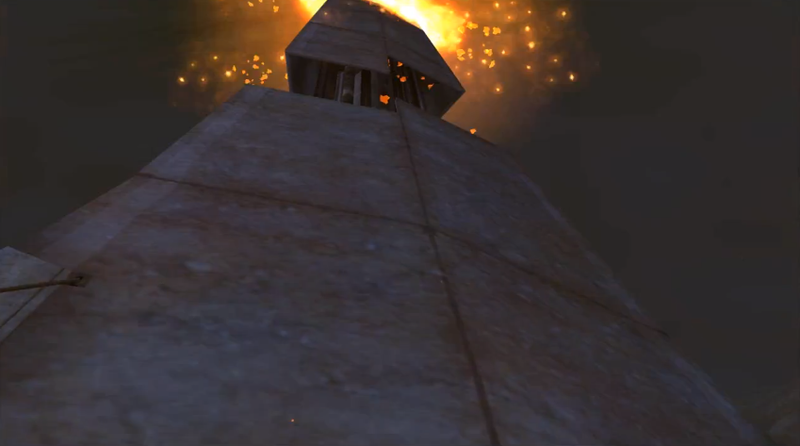 The top of the tower standing above the Central Plaza had been hit by a Mechon blast and was now falling directly towards the boys. They leapt out of the way in opposite directions as the tower top crashed down between them. Shulk quickly turned around to see Reyn watching him, his friend oblivious to the M72 sneaking up to him from behind. Reyn turned just in time to block the machine’s claws with his shield, and was now grappling with the creature as it tried to crush him. 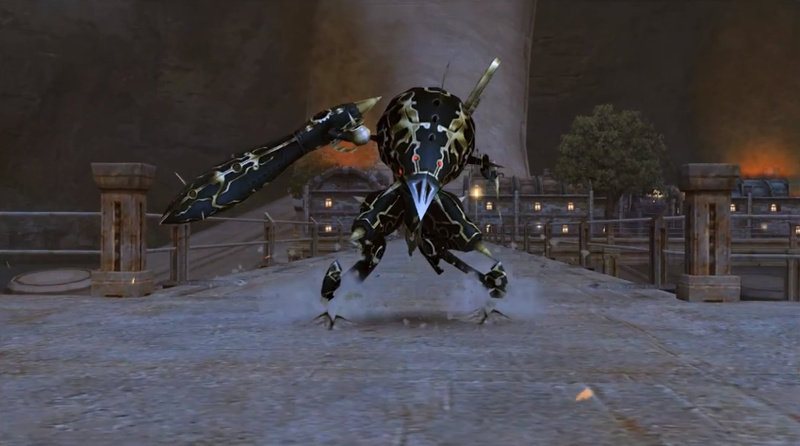 Shulk ran up to it and began to attack it, his sword bouncing uselessly off its side. A long, low cry alerted the boys to someone else’s presence. It grew louder, and louder; Shulk stopped his senseless bashing to stare at the bridge leading to the Military District. Dunban grinned as he danced through the crowd of Mechon, shouting as each one collapsed at his feet. He leaped into an M72 and stuck his shining blue blade straight through it. They hurtled across the plaza together and Dunban flipped in the air; the Mechon flew off the end of his sword and skidded across the ground before him. 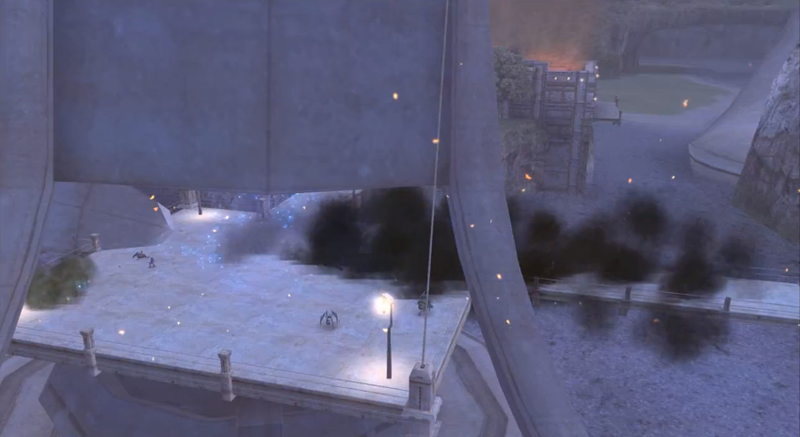 Dunban landed neatly on the ground as explosions lit up the bridge and all the Mechon on it were no more. 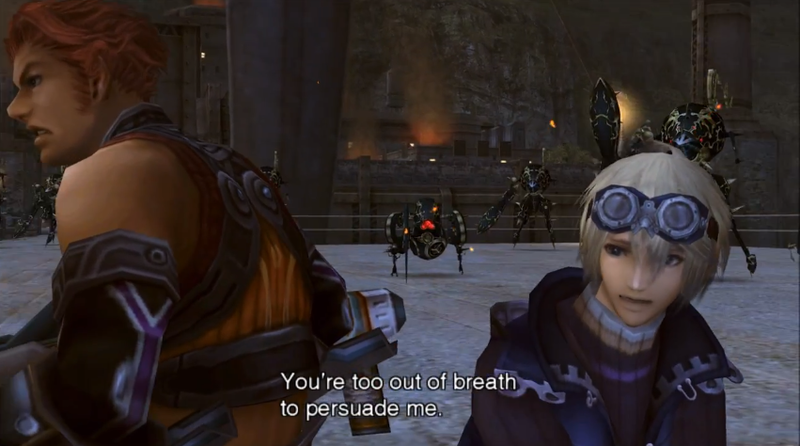 A smile crept up Shulk’s and Reyn’s faces as the smoke cleared. Dunban was clutching a bright red sword in his left hand while his right arm hung limply by his side. Blue electricity licked his entire body and the sword itself as he straightened up and surveyed the area. 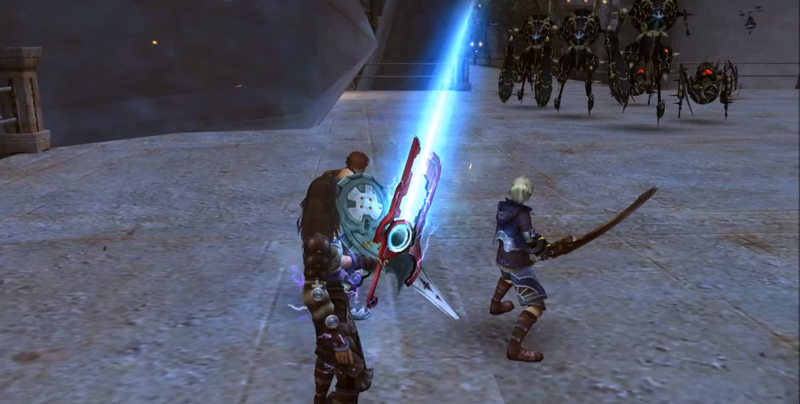 “The Monado!” A wave of relief washed over Shulk when he saw the weapon. “Dunban!” Shulk ran over to him with Reyn. “Woah, yeah! The Monado!” Reyn was just as excited as Shulk to see it. Dunban prepared himself as more Mechon approached from the Commercial District. “Ready lads?” He cast Enchant, and grinned as Shulk and Reyn shouted excitedly, the three of them now covered in a bluish-purple aura. Dunban eyed the machines walking towards them; some hovering M31 scout units, a hulking M82 and an assortment of M69 and M72. Dunban plowed straight into the machines and started felling them with ease. Shulk and Reyn looked at each other and nodded; together they charged a nearby M69 and marvelled at how easily their weapons sliced through their foe’s armour. The pair grinned; the Mechon crumbled. “Let’s do what Dunban said and take out the little ones, yeah?” said Reyn. “Before one of ‘em shoots ya in the back again.” Shulk nodded and the two of them split up.